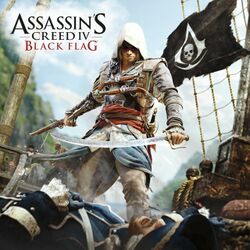 Assassin's Creed IV: Black Flag is a historical action-adventure open world stealth video game developed by Ubisoft Montreal and published by Ubisoft for PlayStation 3, PlayStation 4, Xbox 360, Xbox One, Wii U, and Microsoft Windows. It is the sixth major installment and the fourth numbered title in the Assassin's Creed series. It was released on October 29, 2013 for the PlayStation 3, Xbox 360, and Wii U, and in November 2013 for PlayStation 4, Xbox One, and Microsoft Windows. The historical plot of the game is set in the 18th century Caribbean during the Golden Age of Piracy, and follows the pirate Edward Kenway, father of Haytham Kenway and grandfather of Connor from Assassin's Creed III. Since Desmond Miles died in the previous game, the present-day sequences now follow a generic silent protagonist and are shown in first-person perspective.